There is no group more closely tied to quilt making than the Amish, yet Amish were relatively slow to adopt the craft. The first quilt or the beginning of quilting is relatively unknown to historians and hard to pinpoint. What we do know is that evidence of quilting in various forms has been found all over the world for centuries. Quilted garments on an Egyptian pharaoh carving, quilted floor coverings in Mongolia, quilted armor worn by crusaders and knights of the Middle Ages–the art was born of necessity and supported all parts of life. Quilting was brought over to the New World by European settlers, but the Amish only started creating them in the late 1800s – nearly 150 years after they began emigrating to North America. In fact, very few Amish quilts were known to be made before the 1870s. Prior to then, Amish families used traditional bed coverings, rejecting what was then considered “fashionable”. While not much is known on how Amish women started learning to quilt, experts can use trends of the time to examine what may have led to the adoption. Amish communities are known for their simple lifestyles and art for the sake of art doesn’t really fit into that way of living. 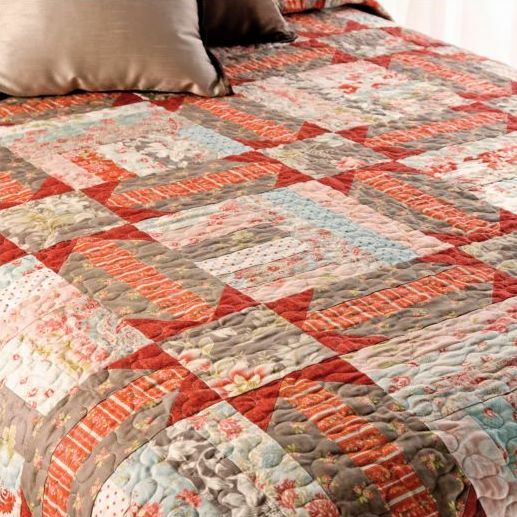 However, Amish quilt patterns are distinctive and beautiful no matter how simplistic. The Amish in Pennsylvania created their own designs, moving on from one color whole cloth quilts to patterns filled with basic rectangles. From there, designs got bolder, introducing baskets, stars, flowers and grapevines. First these new designs appeared only in corners and borders, but embellishments eventually moved inward. The Amish soon began sharing their quilts with one another as gifts and dowries. Many Amish quilters worked on their quilt tops during winter in preparation of quilting bees with their community when the weather warmed. Quilting bees are gatherings where quilters come together to help each other assemble and complete their quilts. Similar to all other quilting bees, these gatherings provided Amish women the chance at socializing with one another. By the 1960s and 70s, America pop culture was shifting with a heavy focus on modern, geometric and abstract art. Amish quilts fell into that aesthetic, attracting a wide audience of artists, art critics and everyday people to purchase and display them within their own homes, collections and galleries. The demand for them quickly grew, leading people to even visit Amish homes to propose purchasing any quilts the family might want to sell. In fact, there are many stories citing that Amish families had quilts stolen right from their clotheslines. It didn’t take long for the Amish community to start taking control of their production and sales. In 1972, the first Amish-run quilt shop opened in Lancaster County, Pennsylvania by Hannah Stoltzfoos, selling quilts on consignment. Of course, before then and even after, many businesses operated outside of homes. By the 80s, Amish quilts were iconic and became symbols of “simplicity, heritage and rural values”. What Makes Amish Quilts Different? “In the world, not of it.” – This phrase is closely followed by the Amish community. It describes the balance of Old World Amish and conservative views with the modern world growing around them. Amish quiltmakers honor it by embracing commercial and factory fabrics alongside quilting publications as allowed by their church. Ordnung – These are the guidelines provided and governed by church districts. Most local Amish Ordnung limit fabric that can be used in clothing to solid colors only. Typically, the same fabrics used in garments are used in their quilts. While not all Amish quilts feature only solid fabrics, many do. Gelassenheit – The German term that describes an individual’s submission to God and the community. Gelassenheit manifests in Amish quilting both in the community regulation of fabric and pattern choices as well as the practice of passing quilts from one generation to the next. Humility Block – There is rumor that every Amish quilt hold a block with a planned mistake. The legend is that Amish quilters believe an attempt at human perfection mocks God. Whether that is true or not has not been proven, but the idea has been perpetuated and discussed for decades. While we sure do love seeing Phil at the beginning of February, we love even more thinking about how some traditions can affect modern life. Quilting is one tradition that’s rooted in history but adaptable to trends. Has this dive into Amish quilting inspired you? Tell us about your project idea in the comments! And don’t forget to subscribe to our blog for more articles like this.